Getting your goald needs four things. You have to know where you are. You have to know where you’re going. You have to find your route. You have to start moving. We have a tendency to discount our strengths, there’s a false sense of humility but also, it’s easy to dismiss what comes easily and if we’re good at it, it’s easy for us. Pay attention to the times when people around you just can’t seem to get it. There’s nothing wrong with them, you’re just working in an area where you’re strong. You can also ask people you trust; they are often more aware of our strengths than we are. Before you do anything, get clear on the emotional reasons behind your goals. WHY do you want the thing(s) you want? This is the wind in your sails. What is the emotional drive that pushes you forward? You may also find there’s a way to that emotional end that’s clearer and simpler than you imagined. If you’re not sure about where you want to go, then consider the possibility that you might just be happy, but have fallen victim to the incessant stream of babble trying to convince you that you can’t be happy without buying their product. If you’re happy and you know it, then be happy and know it. If you need to do a little exploring to find out what you want then give yourself permission to do that. If that’s a problem, then come see me, I’ll give you permission. If you know what you want, but are afraid, then be afraid and start moving. Nothing decreases fear faster than forward motion. If it seems too big, you’re right. You can’t write that book, build that house, make that journey. No one can. But you can write one paragraph, lay one brick and take one step. No one ever accomplishes great things. They accomplish small things consistently. You can do a LOT of things in your life, but you can’t do them all at once. Choose ONE! Clear everything that isn’t yours. Let other people live their own goals. “Sensible” and “Realistic” are illusions, they don’t really exist. Still too many options, do several of them have the same underlying theme or can be combined? Still too many options, can’t choose? Clear out one from the bottom, then another, then another. (Also a great way to sort out priorities). Still have more than one option? JUST CHOOSE. Throw a dart, pick a card or go with “mo” as in Einy Meany Miny Mo. Then stick with it. There will be problems and doubts, but if you change course you’ll spend your life going round in circles – it feels like you’re accomplishing a lot but you’re getting nowhere. Trust me on this. Do your homework, ask people who have gone before you, but in the end, trust your intuition, your guts, your subconscious. It takes practice, but it’s simple. Ask a clear positive question. Ask how you can find love, not why you can’t find love. Ask how you can live in abundance not why you’re broke. Then stop thinking about it. Go do something that sets your mind free, dance a jig, play, go for a walk, or (my personal favourite) sleep. The answers will come, not always immediately, but they will and they will surprise you. The learning is in the doing. If you’re afraid of moving in the wrong direction, start moving. You won’t know if it’s the wrong direction until you start moving. You’re going to run into problems, sorry. Doubts will form walls that look unpassable. The straights of Yabut. Yah, but I’m too old, Yah but I’m too young, Yah but they don’t know me, Yah but I’m not sure…you get the picture. Keep moving. This voice never shuts up. Keep moving. You get better at ignoring it. Finally, you will run into storms, the prow of your boat is designed to face those storms head on. If you run from them, or ignore them, when they finally catch up to you, they’ll be more intense, you’ll be exhausted, and you’re in the storm longer. Face it and get out the other side as quickly as possible. Thanks for reading this, but the real learning is in the doing, stop reading and start moving. 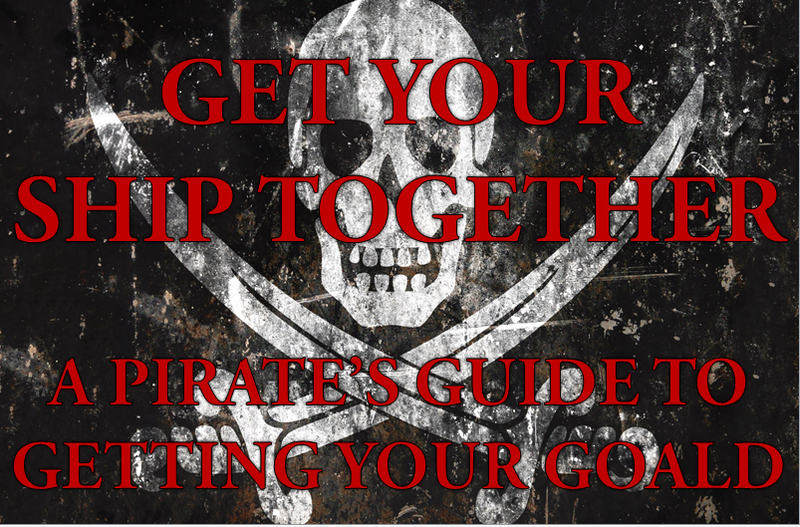 This entry was posted in Get Your Ship Together and tagged Get Your Ship Together, goals, motivational Speaker, Pirate, Rob Corbett. Bookmark the permalink. A very sleepy but sincere thank you.